Hello sunshine!! 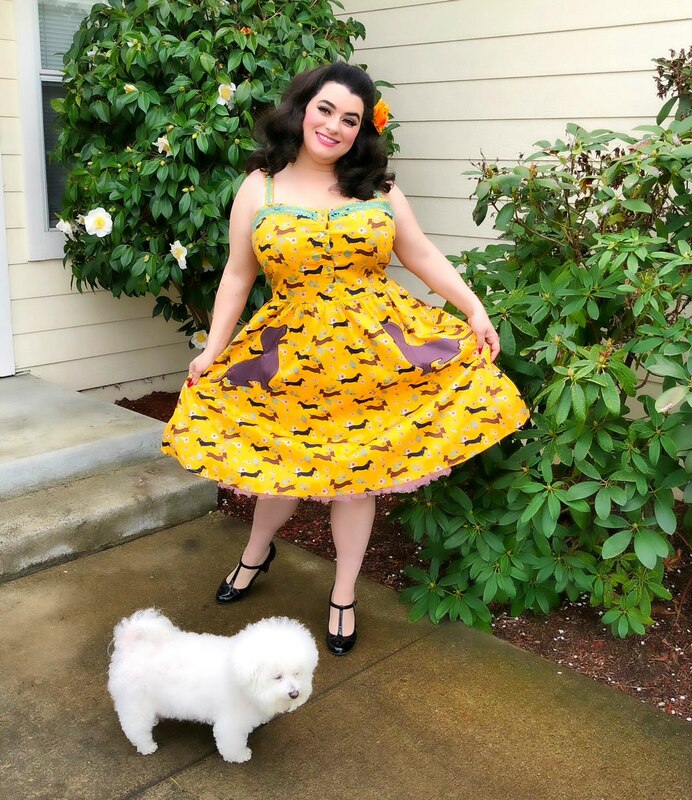 It has been raining so much here in California that the minute it stopped hubby and I ran outside to snap some pics in this absolutely adorable dress “Corinna” Dachshund Print Swing Dress from Lindybop. This was my first Corinna style and I loved the adorable print of Dachshunds and flowers. The dress had a bit of a homespun look with the mint colored rickrack and Dachshund patch pockets making it that much more adorable. The fabric is so light (97% Cotton 3% Elastane) with some stretch that this will be a go-to summer dress for sure. I also love the button detailing on the bust. I really like the smocked elasticated back that vintage style summer dresses have. The full skirt is fantastic so you can wear a petticoat if you want for additional fluff and I am wearing one in these pics. Let’s talk about fit now. I have had many of you ask about fit and what size I am wearing. I went by the online size chart and to fit my bust so, I went with the size 20 knowing it would be very roomy in the waist as I have a naturally small waist. Once the dress arrived and I tried it on, I could have easily sized down. So, for those interested in this style be sure to check the online size chart and the fabric to make sure there is some stretch so you can make your decision wisely. 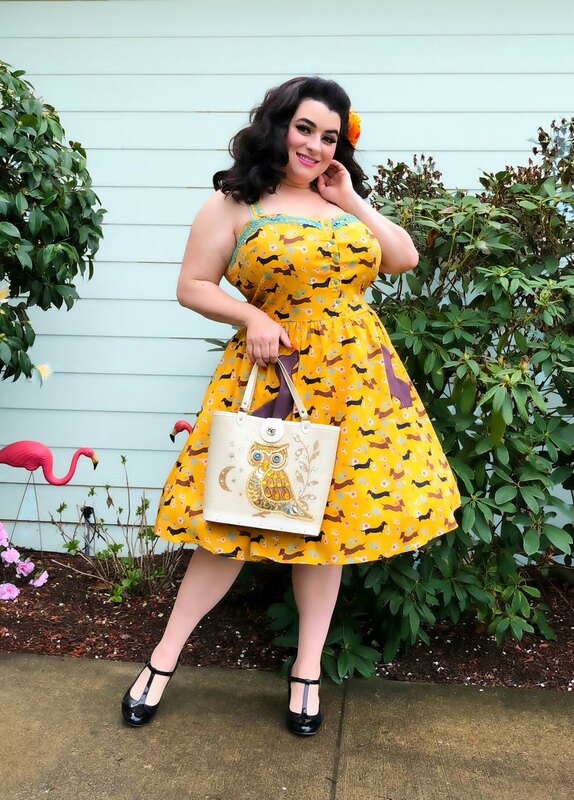 I was able to style the dress nicely and added a mint cropped cardigan and my vintage Enid Collins owl purse…… I didn’t have a dachshund purse and I thought the owl color matched pretty nicely with the dress. Luna, my Bichon Frise wasn’t too terribly upset with me for wearing a dress with Dachshunds and not Bichons. 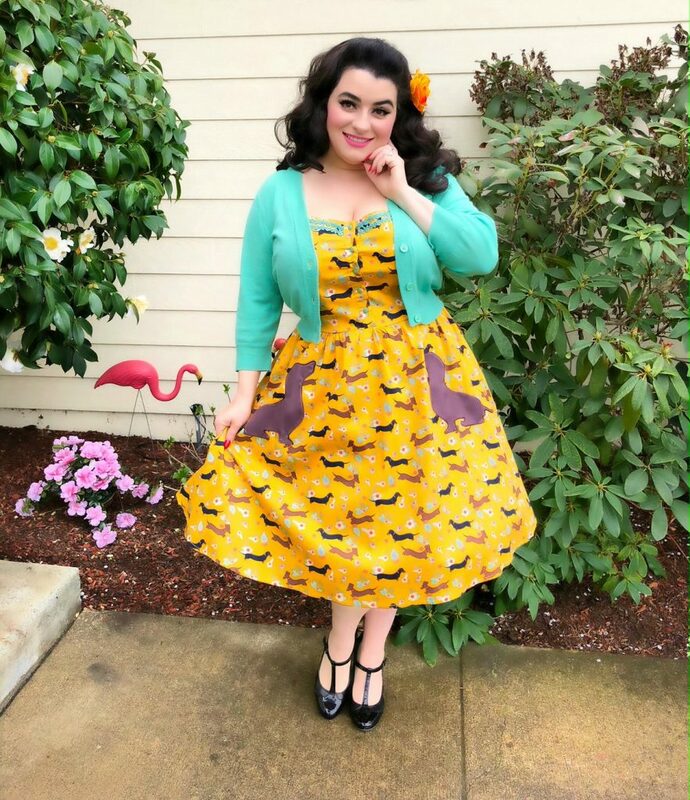 The Corinna is a very comfortable style with so many details in the adornments and it is priced really affordably as are most Lindybop items. 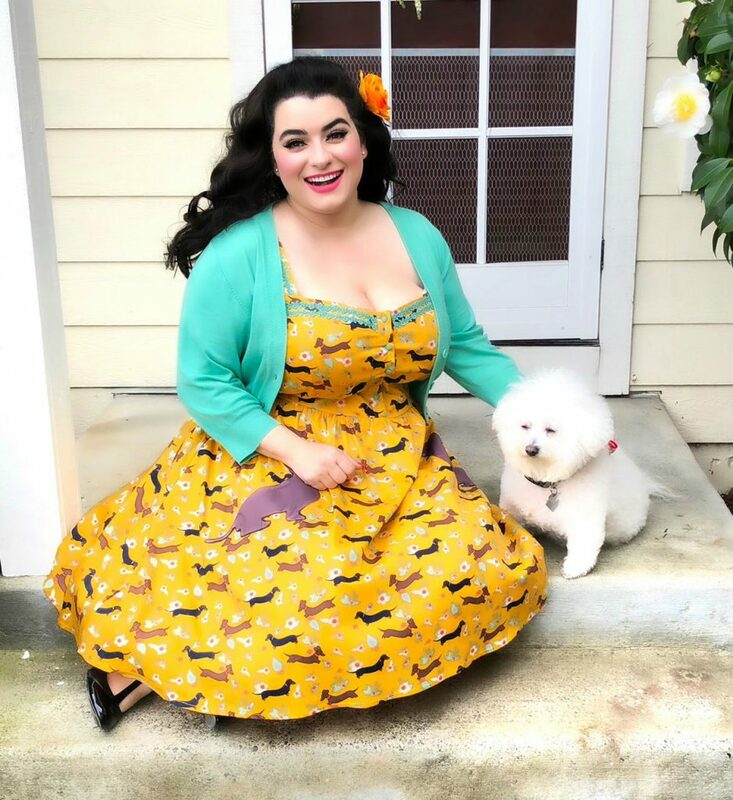 Lindybop really has one of the best selections of prints and styles and I am amazed by how incredible they are season after season. I look forward to many more Lindybop dresses and I can’t wait for my next Corinna. This Dachshund print swing dress is almost all sold out online so hurry over to Lindybop and snapped yours up!! All pics by my wonderful hubby Gary Greco.